A small contingent of Wolves cross country runners converged on Tumbler Ridge on Saturday and swept the top two places in the womens 6 km distance at the Ridge Ramble Cross Country Running race. Second year runner Kayla Hardy crossed the finish line first in a time of 28:31, 82 seconds better than Apprenctice Coach Mallory Pinnock. Calla Scott (6th) and Kirsten Manz (8th) also represented the Wolves on Saturday. Next up for the Wolves X-Country team is the NAIT Open in Edmonton next Saturday, October 13. Also next Saturday, Race #8 in the Wolves Cross Country Series, the Dawson Creek Sneak takes place at the Bear Mountain X-C Ski Trails. 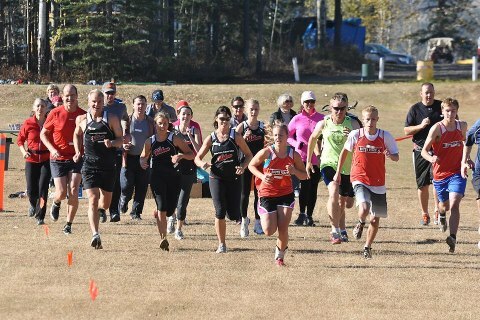 This entry was posted in Cross Country, Uncategorized and tagged Cross Country Running, Eaglesham, GPRC Wolves X-C Running, Ridge Ramble Race, Tumbler Ridge British Columbia, Wolves, Wolves X-C Running Series. Bookmark the permalink.